On the eve of Thanksgiving, I bow my head to lift prayers of gratitude. Life has presented its share of tribulations, but I know to count my blessings. With my eyes closed, I see a classmate standing by his white-topped, teal-blue Chevy II at the Dairy Queen on the corner of Macon and Pine streets. 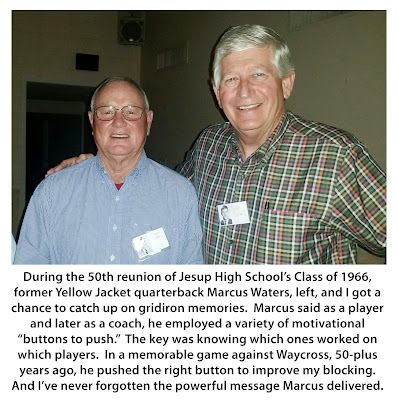 In that half-century-old flashback, I can also see my friend roaring into Jesup High School’s parking lot on his Honda 90 motorbike. But the most vivid image is number 19 standing before the huddle, almost backed up against our end zone. As he glared at me, our quarterback’s eyes were hurling lightning bolts. With a thunderous slap to the side of my helmet, Marcus Waters barked, “Get in the game, Dink!” My ears were ringing inside the scuffed gold headgear, but I heard his next command, too. Looking from left to right in the two rows of Yellow Jackets, Marcus said, “I’m going to the end zone! Y’all can come with me if you want to.” When we hustled to the line, Marcus surveyed the opponents’ lineup. Then, he tapped center George Ogden on the hip to signal an opening in the defense. Taking the snap, number 19 shot the gap, scorching Jaycee Stadium’s turf for a score. Trailing Marcus were 10 Yellow Jackets and 11 panting Waycross Bulldogs. There have been legions of leaders in my lifetime. Marcus, as a field general, ranks among the best. His charismatic competitiveness carried into college, where he helped East Tennessee State, as a strong safety, lead the nation in interceptions. Another hardnosed Jesup quarterback, Buddy Bennett, was his position coach for the Buccaneers. 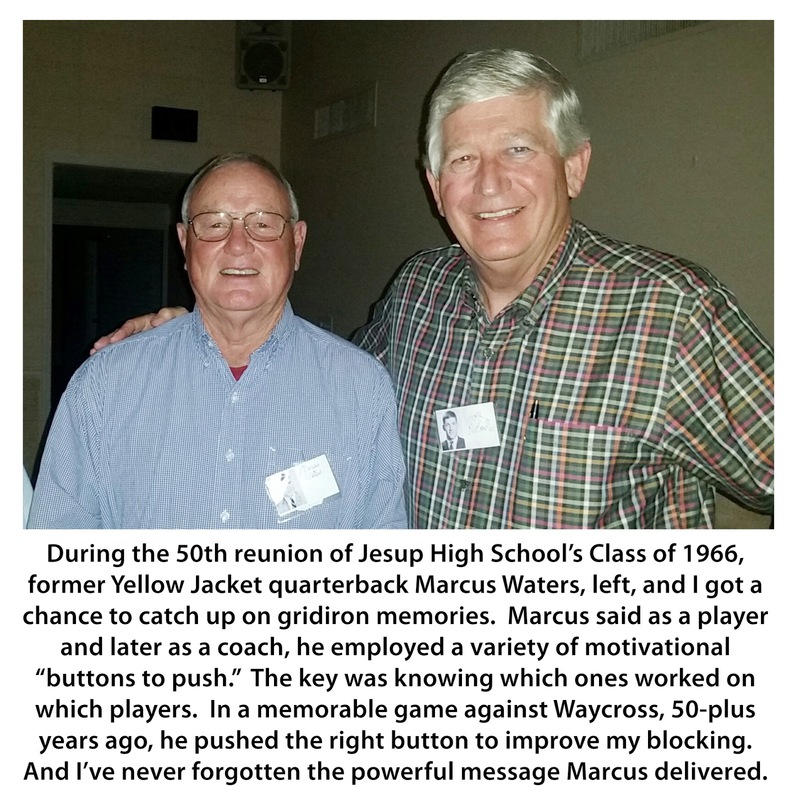 After leaving Johnson City, Tennessee, Marcus spent the next 30 years coaching a game he’s loved since he was 9. Today, he’s retired and a resident of Warner Robins, where he spent most of his career. Since our high school days, Marcus and I don’t see much of each other, except at class reunions. Without fail, he would always apologize for hitting me. And each time, I shrugged it off with a nostalgic laugh. So, during this season of thanksgiving, I thank God for my family, my friends, my hometown and our abundant natural resources. If you are still on the sidelines in this David-and-Goliath environmental battle, I won’t give you a head slap.